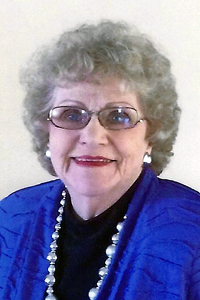 June Egland, 92, of Rochester died Thursday, January 31, 2019, at Season’s Hospice House after a week’s stay. During the last year of her life, she battled the resurgence of her multiple myeloma cancer, which greatly intensified over the last three months. Anna June Clair, youngest child of Anna (Stransky) Clair and Charles Clair was born April 8, 1926, at the family home in rural Jewell, Iowa. She attended a nearby country school, and then worked as a housekeeper for local families and later as a store clerk. June was baptized as one of Jehovah’s Witnesses in 1943 and her faith remained very important to her throughout her life. On March 13, 1944, she married Kenneth Egland in Webster City, Iowa. Her husband was a carpenter and farmer during the years they lived in the Jewell and Webster City areas. They purchased a farm near Eyota, MN in 1969, and farmed there until they moved to Rochester, MN in 1974. A homemaker her entire life, she enjoyed keeping a clean and orderly home. June’s family was important to her, and she always did her best to be a caring wife, mother, grandmother, great-grandmother, sibling, and aunt. She was an excellent baker, and will be remembered for her delicious apple, pumpkin, and pecan pies with their exceptionally tasty and flakey crust, as well as her chocolate cake and homemade chocolate sauce. No one left her home hungry! June was known for her kindness, generosity, hospitality, and welcoming nature. She was strongly committed to care for her own needs so as not to burden others. Throughout her life, she enjoyed and greatly appreciated the many visits, calls, and cards from family, friends, and neighbors. Surviors include a son, Loren (Cristina) Egland of Antioch, CA; a daughter Jone (Dan) Trapp of Mantorville, MN; four grandchildren, Summer Egland of Cornville, AZ, Autumn (Jose) Agosto of Placerville, CA, and Zachary and Zoey Trapp of Mantorville; two great-granddaughters, Crystal and Violet Agosto of Placerville. She was preceded in death by her husband of 72 years, Kenneth, who died in June 2016, and her 15 older siblings, Mabelle, Blanche, Elizabeth, Florence, Benjamin, Emma, Bertha, Charles, Howard, Lucille, Elmer, Frances, Gladys, Clarice, and Gertrude. Visitation will be Saturday, February 9, 2019 from 10:00 a.m. to Noon at Ranfranz & Vine Funeral Home, 5421 Royal Place NW, Rochester, MN. A brief memorial service will be held at 12:00 p.m at the funeral home. Burial will be 12:30 p.m., Monday, February 11, 2019 at Graceland Cemetery in Webster City, Iowa. Rochester, MN 55901 (507) 289-3600 www.ranfranzandvinefh.com.